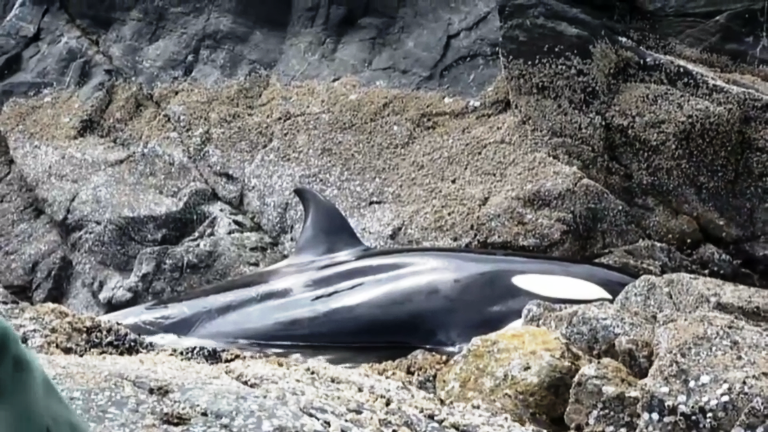 A pod of killer whalers was hunting for seals when a young female orca was left stuck between large rocks along the remote coast of British Columbia, Canada. The confused and terrified whale was showing severe signs of stress. 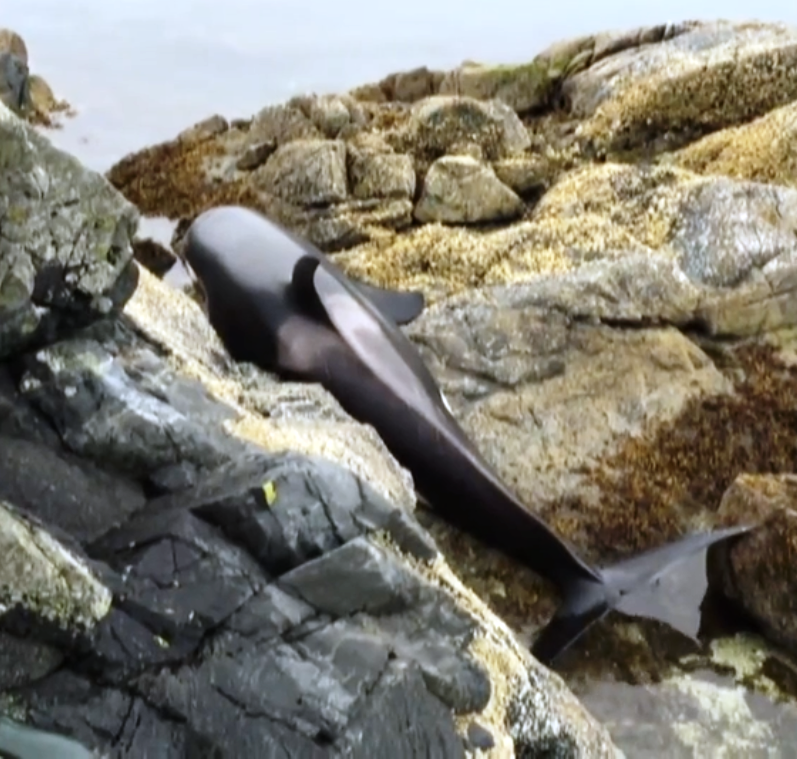 It was evident that the young creature was in pain as her body is stranded on sharp rocks. 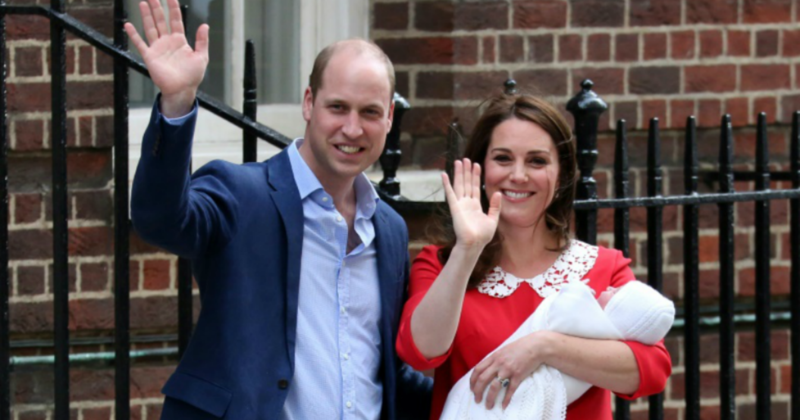 Fortunately, rescuers spotted the whale and they approached her right away. They were heartbroken as they listened to the young orca let out cries of pain and terror. They tried everything they could to give her comfort. It was a traumatic experience for all of them. When George Fischer heard a sailboat call in over the radio about the stranded whale, he gathered volunteers to help free the distressed orca. The creature didn’t have much time as her skin was drying up. 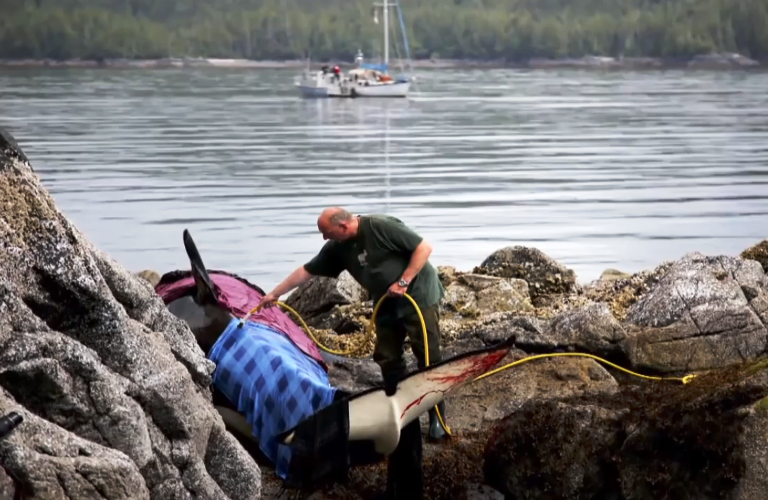 Whale researcher Hermann Meuter also helped and they covered the killer whale with wet blankets. They also doused her with pails of salt water so she could calm down. 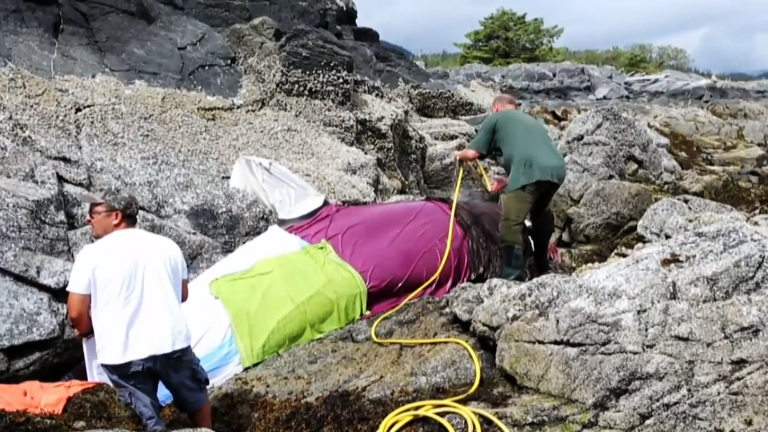 Before the rescuers arrived, the whale’s breathing was heavy and fast. She started to relax when they doused her with salt water and covered with a wet blanket. Because the whale is stuck on sharp rocks, dragging her out to the sea would have been fatal. 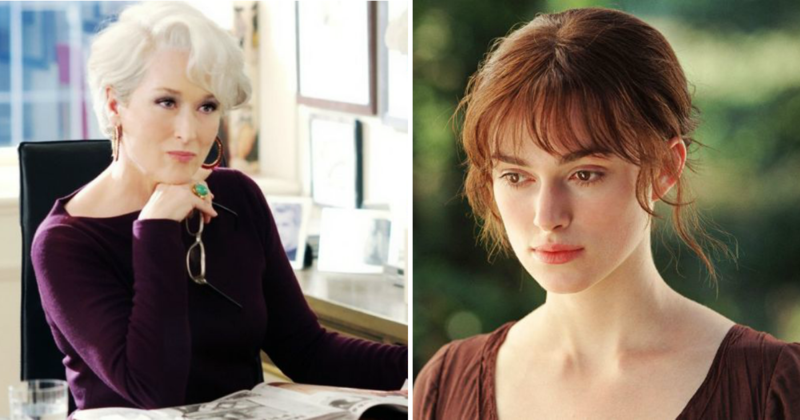 But these good people knew what to do to save her. The team worked tirelessly and diligently for eight hours to make sure that the young whale would survive. 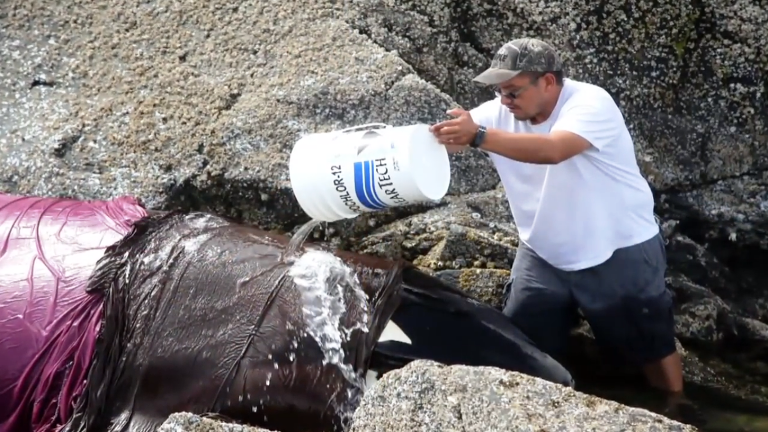 With multiple buckets, hoses and giant soaked comforters, they were able to give the orca another chance at life. When the tide was high again and covered the rocks, the killer whale was finally able to swim away! Her pod was also waiting for her in a distance. It was an amazing feeling and sight for everyone involved! Do you also feel glad that kindhearted people make time to save animals? SHARE this inspiring story with your family and friends!